Ah, the amazing grapefruit. It's not exactly season-appropriate, but there weren't any new pumpkin products on the shelves during our last TJ's run. Just as well. October is definitely the best month for a pumpkin blitz. That is, if we can find something pumpkin-flavored that we haven't reviewed yet. At any rate, it's still fairly warm here in South Jersey these first few days of fall. So a spring/summer beverage isn't too far off the mark. Some might say grapefruit and its derivative juices are year-round treats. I certainly wouldn't argue with that, either. I grew up eating grapefruit halves at breakfast time. I'd put Sweet'n Low or Equal on it and spoon out the sections one by one. **Please note: I am not advocating the use of artificial sweeteners. My parents had them on hand and told me to use them. I was a just little kid and didn't have a say in the matter. ** Then at the end, I'd pick up the grapefruit, hold it over a glass, and squeeze it as hard as I could. Actually up until the age of seven or eight, I'd have my dad do it for me. It was a kind of coming-of-age when I finally developed the upper body strength to match my father's grapefruit-squeezing skills. And man, there was only about a quarter cup of liquid that came out of the mostly-consumed grapefruit, but that juice was always amazing, despite a trace amount of artificial sweetener. Now, as an adult, I don't eat fresh grapefruit as often as I used to, but I still do the same thing when I finish half a grapefruit—and the juice is just as amazing as I remember it. Fresh-squeezed is always the best. Since then, every glass of bottled grapefruit juice I've ever consumed has had to stand up next to that pristine quarter cup of heaven that I'd produce myself at the end of my breakfast—and pretty much every glass of bottled grapefruit juice has been found wanting. And while I want to say that's the case with this beverage, it's really like comparing apples and oranges. 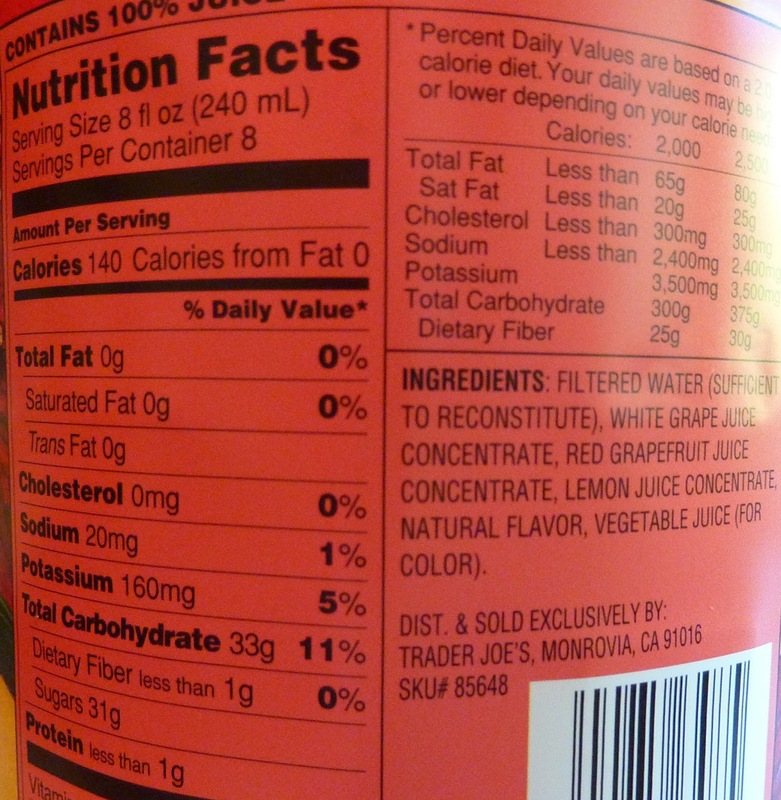 Or grapes and grapefruits, if you will, because the number one juice ingredient here is white grape juice. This is a grapefruit-flavored juice blend, not unlike Ocean Spray's famous Ruby Red. In fact, Ruby Red uses white grape juice to sweeten their cocktail as well, but it plays second fiddle to the red grapefruit. In TJ's mix, there is apparently more white grape juice. If you try really, really hard you can taste the white grape, but by and large, all the extra white grape juice does is make the blend slightly sweeter, and in my opinion, perhaps a tad less tart. That's the best way to describe this juice: like Ocean Spray's Ruby Red Grapefruit Juice, but leaning toward sweet rather than tart. And that, in my book, makes a pretty decent, refreshing juice drink. I give this beverage 4 stars. Sonia gives it 3.5. You should try the pumpkin frozen toaster waffles! Yum! Visited two Trader Joe’s in recent days. Neither had the Rio Red. Not even an empty space where it should have been. Asked at the second store if they were going to get any. Was told it has been discontinued due to lack of sales. Sad.